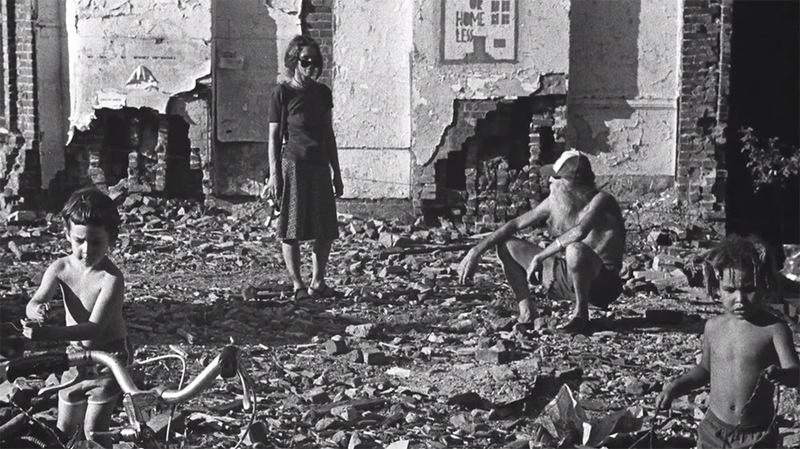 In 1975, artist and social activist Adam Purple, known for his permanent purple attire, looked out his window in the crime-ridden Lower East Side of New York City to witness two children playing in a pile of rubble. Struck by his own memories of a childhood spent barefoot in rural pastures and forests in Missouri, he suddenly wished these children could feel the dirt beneath their own feet in a safe, debris-free environment. Almost immediately he began work on the Garden of Eden. Over period of five years, Purple worked continuously to build a concentric garden that would eventually grow to 15,000 square feet. As nearby abandoned structures were torn down the garden continued to grow, a process he metaphorically likened to a garden that knocked down the buildings around it. He physically hauled bricks and building materials away from the site, and hauled in manure from the horses in Central Park. The Garden of Eden not only provided safe haven to the community, but also produced food in the form of corn, berries, tomatoes, and cucumbers. By the early 80s it had become a famous and beloved landmark in the Lower East Side. Unfortunately the city of New York never officially recognized Purple’s garden. While other local parks were clearly marked on official city maps, the Garden of Eden space was always labeled as ‘vacant’. Despite pleas from the community, the entire garden was razed with bulldozers in just 75 minutes on January 8, 1986 to make way for development. Purple himself narrates his story in this thoughtful video by Harvey Wang and Amy Brost from back in 2011. Sadly, he died two weeks ago at the age of 84, and there is currently a fund-raising effort to collect money for his burial and to erect a memorial near 184 Forsyth Street where the garden once stood. You can see more photos and read more about Purple in this book, also by Wang & Brost.